Something really extraordinary happened during a recent performance of Wagner’s Die Walküre at the Royal Opera House. The first revival of Keith Warner’s provocative staging went on stage less than 48 hours after the London bombings, and something in the nature of the opera’s humanity took all of its participants to a new level. This, after all, is the Ring opera in which it is first established that the future of the world lies with humans, not gods. That is essentially what the Ring is all about. So could lightning strike twice, without sets, without costumes, without all the attendant drama of a darkened auditorium? Would the fire descend, not through the pyrotechnics of audacious stage effects but through the music alone? Yes, yes, and yes. In a music festival – namely, the Proms – that is always notable for at least a handful of real “events”, this one will go down as momentous. Die Walküre begins with a storm, and Antonio Pappano was not about to take cover. The Royal Opera House Orchestra flung down the gauntlet, string tremolandos buzzing, Wagner tubas cleaving the heavy air, timpani volleying their thunderclaps, and we were off. Pappano’s lustful dynamism is a real boon in this the most unashamedly passionate of the Ring operas, and his orchestra, released from the depths of their pit for once, revelled in the big Albert Hall acoustic. With the lid taken off them, so to speak, with their sound able to breathe, we could appreciate all the more what a glorious instrument they are. The quiet brass playing was especially notable: I shall long remember the sombre threnody of horns and trombones launching Wotan’s Act II narration. Bryn Terfel sang, acted, almost spoke that with such enthralling and quiet intensity that it was almost as if he were individually telling the 6,000 or so members of the audience a bedtime story. You can take risks – and he did – with an audience this concentrated, this giving. Audiences don’t realise how important they are, and this one, not just listening but hanging on every word, tacitly gave each performer untold energy. Gripping was not the word. Well, it was, but still hardly adequate. And so performances, thrilling enough at the opera house, here went into overdrive: Waltraud Meier’s sublime Sieglinde, her inwardness something most singers can only aspire to; Eric Halfvarson’s cavernous, pit-bullish Hunding; Rosalind Plowright’s imperious Fricka; and Lisa Gasteen’s feisty, tomboyish Brünnhilde finding another level of engagement in her moving final scene with Wotan. Their lustful farewell kiss could no more adequately have expressed what Pappano was unleashing from the orchestra at this point. And what can Placido Domingo have made of his Prom debut? Well, he more than anyone plainly fed on the waves of adoration coming in from the audience. It was so good to hear this great veteran of the opera world recapturing some of that burnished middle-voice that made him such a household name. Though the vocal nuancing may be compromised by the passing years, the distinctive timbre remains untarnished. To hear it breaking the silence in the wake of that storm-tossed prelude, the very first voice we hear in the opera, was in itself worth the price of admission. There’s a fair bit of operatic history riding on that voice, that timbre, that presence. And how wonderful to hear it rise to the great cries of “Walse!”, the second of them defiantly turning back the clock to a heroic past. Not even the incongruity of those “battle-weary” Valkyries arriving in full evening dress, or the half-hearted attempts at an atmospheric light show could blunt the dramatic potency of the evening. The audience rose as one. For me, twice in less than a fortnight wasn’t lucky; it was a privilege. This, astonishingly, was Plácido Domingo’s Proms debut. That alone was enough to create an immense buzz around this wholesale transfer of the Royal Opera’s Die Walküre to the Albert Hall, in staged concert form. But the fact that the evening ended with the entire cheering audience on its feet – something that rarel happens here – was down to much more than that. Not least of these factors was the fact that the orchestra has been so close to this work for so long. Antonio Pappano’s fast tempos may occasionally jettison some of the music’s spaciousness, but he keeps its energy flowing, and the musical tension crackled. Responding to each other but not in costume, the singers seemed if anything liberated by the absence of a full staging. And Domingo’s Siegmund is indeed extraordinary. His German is not impeccable, and in the more restless passages he can swallow his consonants; but his burnished sound is unmistakable. In the baleful summing-up at the end of his act one narration you could hear exactly why he has been enjoying such an Indian summer in Wagner. Waltraud Meier’s gleaming Sieglinde was a formidable match, and Lisa Gasteen’s huge, penetrating soprano made her headstrong Brünnhilde absolutely convincing. Eric Halfvarson’s Hunding made the balconies reverberate, and Rosalind Plowright worked hard to ensure Fricka’s crucial confrontation with Wotan carried sufficient weight. It was Bryn Terfel’s Wotan, however, that was the heart and soul of all this; though he has barely begun to sing this iconic role, he already has few rivals in it. Singing and acting were so enmeshed, his projection of text and musical nuance so effortless, that it seemed we were tapping directly into his thoughts. An unforgettable performance, capping an unforgettable evening. If the Albert Hall is super sized for Purcell, it is if anything a touch too petite for modern Wagner. Die Walküre, the second installment of the first Proms Ring, has never been done at the Proms before, but Bernard Haitink and the Royal Opera performed it in the Albert Hall as part of their cycle in the wilderness in 1998. That performance was edgy and exhilarating, tinged with dramatic danger but probably also coloured by the company’s then parlous situation. At the end of the cycle’s Götterdämmerung, Haitink made a public appeal to the audience for help and support. The Royal Opera now has a new regime, and the sense of an order on the edge of cataclysm was correspondingly missing. Under Antonio Pappano, who has just conducted the same cast and orchestra at Covent Garden, the orchestra played mostly according to twentieth-century Wagnerian Hoyle, and the nearly impeccable cast sang likewise. If there was less danger, there was enough power and passion to lift the roof. The particular interest for many in the audience was the Proms debut of Plácido Domingo, and his performance as Siegmund was alone certainly worth the queuing. His voice was, as always, strong and beautiful, but not showy and his acting was committed if unsubtle. In a cast otherwise notable for fine diction, though, he often didn’t seem to be singing any particular language: he knew what was going on, and gave it the appropriate emotional force, but, however spurious Wagner’s etymological figures and other word-play might be, they were notably missing in syllables sung to the most convenient consonant and vowel rather than the right one. (This may be the only similarity between Domingo and Joan Sutherland, but Sutherland has never tried to sing Wagner.) Yet Domingo’s Siegmund was undoubtedly stirring. He may have been helped and spurred on by Waltraud Meier as a tireless, implausibly glamorous Sieglinde. Domingo looked knackered at the end of the first act, while Meier looked ready to do it all over again. She too acted in a rather conventional style, but between them they made the requisite sweet music. And there was more. Bryn Terfel’s Wotan was vocally glamorous and dramatically touching. There was something of King Kong about him (Harrison Birtwistle’s as well as the one in the movies). When Fricka arrived, he had something of the look of the great ape in the Charles Addams cartoon, who holds an unconscious blonde as he looks over his shoulder at an approaching Mrs Kong and says “Uh oh”. Rosalind Plowright was in good voice as a decidedly imperious Fricka, and Lisa Gasteen was a chunky, confident Brünnhilde. Eric Halfvarson was a suitably thuggish Hunding with mismatched cummerbund and hanky, obvious no good. A fine crop of Valkyries completed the cast. Michael Moxham’s traffic direction replaced Keith Warner’s conceptual Covent Garden production, and gave the singers just enough context to be their characters completely. Apparently, we are experiencing a period of Great Singing At The Royal Opera – within a week or so, some of us heard Renée Fleming, Ben Heppner, David Daniels, Bruce Ford, Plácido Domingo, Waltraud Meier and Bryn Terfel, but as one of those so favoured I have to report that only Fleming’s Desdemona and Terfel’s Wotan fully lived up to the hype, the others ranging from merely good to rather lazy. Critics are extraordinary, aren’t they – I generally get my reviews done before any print ones are seen, but on this occasion circumstances have made me uncharacteristically late, thus allowing me to read other opinions before my own are committed to publication – and I’ve been quite astonished by the level of hysteria whipped up about this performance, and Domingo in particular, to the extent that one paper actually made the review a feature rather than putting it on the usual pages. Cynics might say that since most critics are old men anyway, they are bound to be delighted by a 64 year old who can, supposedly, still cut the mustard as a young hero, but that hardly explains such truly eye-watering notices as the one in a leading daily paper in which there was absolutely nothing whatsoever written about the singing of the Brünnhilde, the lady in question being mentioned only in passing, with a remark about her frock. I say again, extraordinary – especially as her singing, along with that of Terfel and the orchestra, was one of the true glories of the evening. ‘The old ones are often the best’ / ‘Still as romantic a hero as he was at 34’ etc – the kind of remarks beloved of opera houses which churn out 30 year old ‘revivals’ of ancient sepia productions, not to mention 64 year old ones of ancient sepia tenors. I must be frank and say that I have never been a ‘fan’ of Domingo, save for his Otello: one has to admit however that the voice has worn well – but worn it has, and if you never really liked that baritonal timbre and approximate German (delightfully referred to as ‘personal’ by one critic – I’ll have to remember that definition) then you won’t warm to it now. He puts a lot into it, of course, hand-wringing all over the place and really making the most of Siegmund’s ‘big moments’ – just before ‘Winterstürme’ I honestly thought that the orchestra was going to stop completely and he was going to step even further forward to deliver his ‘aria.’ There was much to savour in his singing – his first phrases always sweep you away, so that moments like ‘Kühlende Labung’ and ‘Zauberfest / bezähmt ein Schlaf’ make up for a great deal of what follows, which is too frequently marred by aspirates and generalized, vowel – dominated diction. What remains in the mind, though, are not the faults but the loving assumption of the character and the moments where he clearly rises to the occasion of the tremendous lines, ‘schuf sie ihr den wonnigen Trost’ being a case in point. 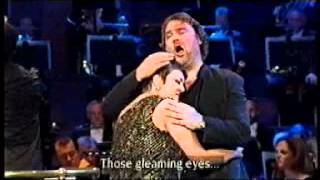 And what of Terfel’s Wotan? Very fine, although probably not quite what many Wagnerians would love: this is a light voice for the role, not so much a James Morris as a Norman Bailey, and it is the latter who comes most frequently to mind when hearing Terfel, whose anguished portrayal of Wotan is very much in the Bailey mould – and that is a compliment, before the owners of the ‘Bryn My Hero’ fanzine compete with those of ‘Plácido my Hero’ for a piece of my scalp. Wotan’s narratives are, of course, terribly boring, ditto much of the long narratives in the ‘Ring’ – come on, now, surely most of them could be reduced to the seven or eight really important lines? – so it’s vital that the Wotan has dramatic skill and stage presence, both of which Terfel possesses to a rare degree, and he manages to convince you that his tortured tale does bear repeating – quite a feat. When you hear him snarl at Fricka or argue with Brünnhilde with such vigour, you wonder if he’s going to make it to the end in the same style, but he does, and ‘Leb’ wohl, du kühnes, herrliches Kind!’ was glorious, the lines shaped with real skill and the diction superb: he may not have the huge heft of tone that some would like at times, but his phrasing and his tenderness in passages like ‘des Lebewohles letztem Kuss’ are irreproachable. Lisa Gasteen’s Brünnhilde was in a different class altogether to other recent London assumptions of the role, her singing (if you want to know what her frock was like you’ll have to look elsewhere) as piercingly clear, heroically convincing and sympathetically shaped as many others have been pallid: her ‘Hojotoho’s reminded me of Rita Hunter (no higher praise) and her ‘Halt’ein, Wälsung’ was not only thrillingly sung but redolent of compassion, especially at ‘Leb’ wohl, Siegmund, seligster Held!’ The key to a great Brünnhilde is the combination of tenderness at moments like ‘Brünnhilde bittet’ and tempestuous power at others, and in this Gasteen succeeds as few others do – she also rode the orchestra easily, no mean feat given the power evident from it. I was less impressed by the Sieglinde of Waltraud Meier: I find her voice rather ordinary, with a slightly fluttery vibrato, and her characterization unmoving – ‘Die Wunden weise mir schnell’ sounded like ‘A cof – fee? That would be great’ and ‘O süsseste Wonne!’ did not produce that ‘lump in the throat’ feeling. She was at her best in the third act, ‘O hehrstes Wunder!’ finally revealing a genuinely moving sound. Rosalind Plowright was brilliantly cast as Fricka, and Eric Halfvarson’s dark voice and brooding presence were ideal for Hunding. Orchestrally, the performance was magnificent: the swift tempo of the overture was ideal, those snarling horns surpassing anything I’ve heard them do before, and the strings so eloquent in the quiet passages – Pappano directed a performance of sheer exhilarating glory in each act, with a kind of dramatic tension and energy as well as serenity where needed, that I have not heard since Goodall. The hype may have concerned itself with ‘The Prom King’ but for me the real ‘star’ was the orchestra. The audience received the performance with the expected rapture, and quite right too: this is one of the greatest works in the whole musical canon, and one hopes that this ‘first’ complete performance of it at the Proms won’t be the last for the near future, although it’s hard to imagine a starrier one. Clou d’une saison particulièrement brillante, la reprise de la nouvelle production de La Walkyrie bénéficie d’une distribution largement renouvelée. Nous ne reviendrons pas sur le détail de la mise en scène, déjà largement évoquée lors de notre précédente chronique : à sa deuxième et troisième vision, les incongruités scénographiques sont moins choquantes, et l’on peut davantage se concentrer sur l’aspect théâtral et musical de la soirée. Sur ces deux points, le changement est d’ailleurs total. Succédant aux “jeunes” Katarina Dalayman et Jorma Silvasti (estimables chanteurs par ailleurs), Waltraud Meier et Placido Domingo pourraient faire figure de vétérans. C’est loin d’être le cas : habitués à chanter ensemble le couple maudit, les deux artistes sont tellement investis dans leurs rôles qu’ils en retrouvent une seconde jeunesse. Le premier acte est un grand moment de théâtre qui met le feu à la salle (alors qu’on sait le public de Covent Garden souvent réservé dans ses manifestations extérieures…). Plus rare, les deux chanteurs savent aussi nous surprendre au deuxième acte, et nous donnent l’impression de découvrir cette scène habituellement un peu sacrifiée. Vocalement, il convient bien entendu de “faire son deuil” des Leonie Rysanek et des James King de l’âge d’or du chant wagnérien. Ceci posé, la performance musicale du présent duo reste tout à fait remarquable. Certes, les limites vocales de Waltraud Meier sont bien réelles : la voix est celle d’un mezzo qui a gagné en aigu au détriment des notes graves ; le bas médium est assez sec, presque parlando (ainsi dans ses récits) ; les aigus sont bien là, mais manquent de l’ampleur nécessaire dramatiquement (par exemple, dans les appels apeurés à Siegmund à la fin de l’acte II). Néanmoins, l’engagement de l’artiste transcende ses faiblesses et lui permet d’assurer une splendide incarnation. De la même manière, la performance de Placido Domingo est confondante : on a du mal à imaginer que le chanteur dépasse les 64 ans. Bien sûr, tout n’est pas parfait : le 8 juillet, le bas médium est un peu graillonnant ; ce n’est plus le cas le 12, mais en revanche les aigus sont plus courts… Qu’importe ces chicaneries face au véritable “don de soi” que constitue l’engagement de cet artiste (toutes les vingt minutes, Domingo avale discrètement une pilule entre deux répliques pour tenir le choc), sans parler de son exceptionnelle musicalité. Bryn Terfel nous devait une revanche après sa prestation de mars qui l’avait vu terrassé par une laryngite. C’est peu de dire que le défi est largement relevé, tant le chanteur s’impose d’emblée comme un des grands Wotan actuels. Pourtant, la tessiture du rôle n’est pas vraiment à son avantage : Terfel est plus baryton que basse et certains passages “rament” un peu, tel le long récit à Brünnhilde à l’acte II, écrit dans le bas médium. A l’opposé, ses aigus sont moins brillants que ceux d’une basse, contrainte à pousser sa voix au maximum : les imprécations de Wotan sont alors peu spectaculaires. Si Terfel convainc néanmoins, c’est par l’extraordinaire intensité conférée au texte, qu’il nous délivre comme un chanteur de lied (on pense évidemment à Thomas Hampson) : chaque mot est coloré, joué, ciselé, sans pour autant que l’artiste ne tombe dans le piège ni de la surarticulation, ni de la surinterprétation. Ajoutons enfin une endurance hors du commun qui permet au chanteur d’arriver aux “Adieux” frais comme un gardon. On pourra en revanche discuter une vision du personnage qui fait de Wotan un parvenu roturier, dépourvu d’aristocratisme : un comble pour le dieu des dieux. Déjà protagoniste de l’édition de mars, Lisa Gasteen affirme son interprétation. Les aigus sont cette fois bien assurés, la caractérisation un peu moins histrionique. La chanteuse serait sûrement davantage à sa place en Sieglinde, mais compte tenu de la pénurie actuelle de formats wagnériens, sa Brünnhilde est d’un excellent niveau ; d’autant que l’acoustique des lieux, favorable aux voix, permet d’apprécier pleinement un timbre riche et lumineux. Rosalind Plowright renouvelle sans changement sa performance de mars : c’est vocalement impeccable, mais assez terne du point de vue théâtral en comparaison avec la démonstration de ses partenaires. Erik Halfvarson est en revanche totalement époustouflant en Hunding : la voix est énorme, terrifiante, à l’image d’un personnage brutal et sinistre. Un autre grand moment ! La direction d’Antonio Pappano, sans doute contaminé par ce plateau effervescent, gagne en tension sans perdre en élégance : dommage toutefois qu’il accélère excessivement le tempo final, effaçant l’impression de grandeur sublime qu’on est en droit d’attendre. Il faut reconnaître qu’avec un orchestre de ce calibre, on peut avoir envie d’en finir : si les cordes tirent à peu près leur archet du jeu, il n’en va pas de même des instruments à vent qui couaquent régulièrement, sans que cela ne semble altérer d’une quelconque manière la bonne humeur des instrumentistes. Une telle faiblesse a quelque chose d’incompréhensible face à la qualité générale de cette soirée, mais ne suffit pas à ternir une série de représentations assez exceptionnelles.